One of the key distinctions of supermarket engineering is the requirement for storing and displaying refrigerated and frozen food products. 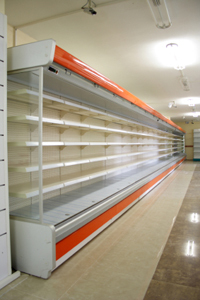 Supermarket refrigeration systems and their sophisticated control systems present a difficult challenge to the uninitiated. The potential for product loss and the high energy demands associated with these systems call for an engineer with extensive experience not only in refrigeration system design, but in energy management systems as well. With over 20 years experience in the design and application of refrigeration systems and controls, you can trust BD Engineering to meet these challenges. The mechanical systems manager for today’s supermarket has an almost unlimited variety of choices to make for refrigeration and control systems: What refrigerant should I use? Which type of compressor should I use? What type of system will best meet my needs? Air-cooled or water-cooled condensers? Will a rooftop machine house solve my space problems? Do case controllers make sense for this project? These are tough questions with long lasting implications, but BD Engineering can help you choose the right answers. Our knowledge in these areas will allow you to examine all possibilities and make informed decisions early on in the design process. BD Engineering can tailor a system to provide you with the right balance of energy efficiency, maintainability and cost to meet your needs and ensure it is installed to provide the maximum benefit. A complete, detailed design with written specifications will allow you to get competitive apples-to-apples bids, eliminating surprises after the bids are awarded. Need to remodel or do a refrigerant change out? No problem. BD's engineers are fully qualified to visit your site, perform a thorough survey of the existing systems, make recommendations, and design a solution to keep your store up and running throughout the renovation. We will even prepare a phasing plan to guide the other trades through the process, ensuring a smooth remodel and minimizing change orders. BD Engineering can even perform a final walk through and generate a punchlist to ensure a quality installation.